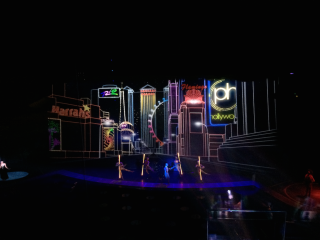 The longest-running production in Las Vegas, the “Jubilee!” burlesque extravaganza resident at Bally’s now features, behind the scenes, a Lightware MX-FR33R digital crosspoint router with redundant power supplies, built-in control panel and CPU2 provided by Chaos Visual Productions. Lightware USA is the US distributor for Budapest-based Lightware Visual Engineering products. “Jubilee!” is a seven-act spectacular, which debuted in town in 1981. It stars iconic showgirls dressed in costumes designed by Bob Mace and Pete Menefee and boasts a set featuring the sinking of the Titanic and a 27-foot, 3-ton bull for the Samson and Delilah tableau. Burbank-based Chaos Visual Productions brought the Lightware router to the show. Chaos Visual supplies the international production industry with the latest in technology and personnel to make their creative visions come to life. Working on live concert touring, corporate events and live 3D video presentations, Chaos Visual has become the go-to company for specialty lighting, LED special effects, video projection and show programming. The Lightware 33x33 router was selected for the permanent install for “Jubilee!,” which includes 11 Ventuz media servers and 16 Barco projectors. The router handles all of the monitoring and signal distribution for the equipment. Since all of the media servers are local the frame is populated with DVI input boards and Fiber Optic output board to feed the longer runs to projection eliminating the need to local Fiber transmitters in the rack.